What would be more fun for children to beat off the summer heat with bunch of new friends, music, loads of fun activities and chilling in the summer with the coolest of the teachers? We, at KJC, have music camps for kids thrice a year. 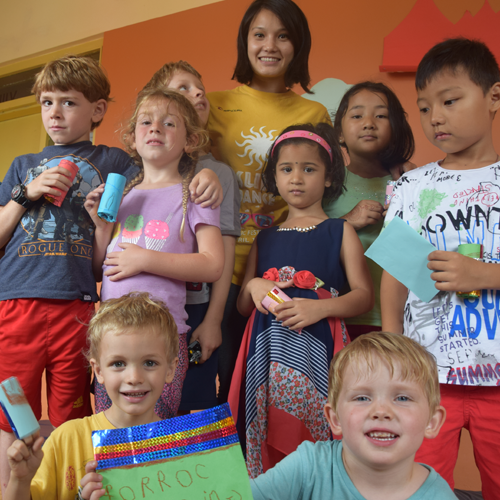 The summer camp is a fun way for the kids to relax in the holidays while learning at the same time. A study of 106 preschool children found that those exposed to a systematic and integrated music program significantly increased their motor, cognitive, language, and social-emotional scores as assessed by the Preschool Evaluation Scale (McCarney, 1992). In the summer camp, children get to learn, enjoy and feel the realm of music. So, basically, children learn about music the most, which has its benefits, but they are also explicitly exposed to areas involving the child’s physical and mental fitness, such as basic taekwondo workshop, dance and movement workshop, wall climbing, treasure hunt, etc. helping them build them physically, mentally and socially, which we believe is necessary as basic survival skills required, and that too with the “fun” factor. This year, the camp started from July 17, 2017 and lasted till August 4, 2017. Previously the camp was scheduled for duration of two weeks, but with the growth in the attendees’ desire to stay for longer period, the camp was extended by a week. It was a happy moment for the KJC team to get such response from little souls who attended the camp and the parting was as-difficult for the teachers. Well, enough of the emotional aspect of the camp but it was really a good experience bonding with those little people. Talking about the activities, we had a bunch of classes that aimed to develop a child in a certain way, such that they could use the explicit and in-explicit tools provided in their course of life. We, in particular, aimed to develop a child physically, mentally and socially. So, basically, going into a little more depth of what we did through the summer camp is that through music lessons — we helped them develop their musical knowledge, with instrument workshop — we helped the children associate their theoretical knowledge in the practical dimension, motor skills are developed via music as well however, we had dance and movement classes explicitly aimed to improve the body-music coordination which helps children feel more confident about their body and movement and hence helps develop overall confidence of a child. Music is art and a piece of art is creativity at its finest. As a music school, we value creativity and it is integrated in anything that we offer. So, in order to improve the “creativity” factor of the children we had some other art workshops besides music as well. We had photography, arts and craft workshop aiding children to visualise the world around us in a creative manner and offering them with skills to develop them. Besides, we had poetry workshop as well for the children aiming to bring out purest form of feeling, that of a child and their perception of this world and their environment. On the top of that we had recitation classes as well with the aim of developing a child’s mass communication ability, which if done from the beginning would result in better skills in the future, which is what we believe in. In the course of the summer camp journey we also managed to set aside time for some cute movies as well, which gave us cute moments to cherish.